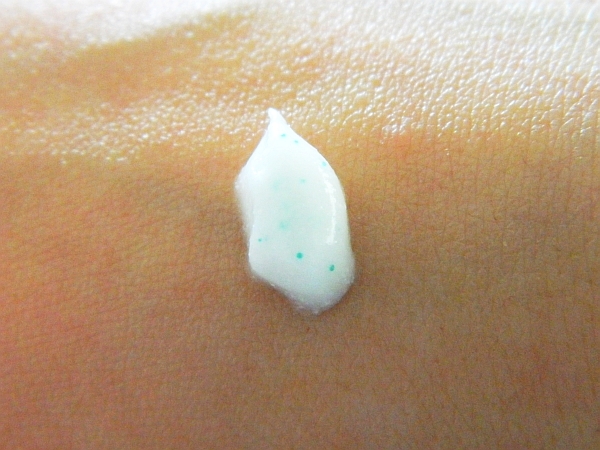 Not sure why my skin is darker here than in the next photo haha, but here's a close up of what the product looks like. You can see the small beads that are used to gently exfoliate the skin. 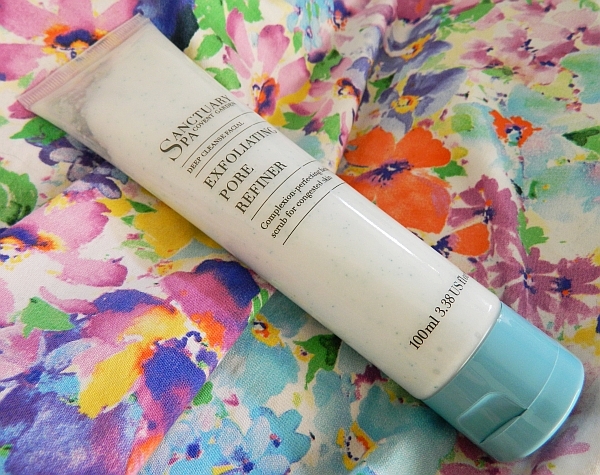 The Sanctuary Exfoliating Pore Refiner has become a key part of my skincare routine. It is described as a complexion perfecting facial scrub for congested skin. Large pores can easily become blocked causing spots and blemishes, so this facial scrubs acts to prevent this from happening. Out of all of the facial scrubs I have tried, this has to be my favourite so far. It just feels a lot gentler than some of the cheaper alternatives and the 'bits' or in this case 'eco-beads' in the scrub do not seem to be as big. The scent is quite citrus-sy but sour, in a good way! It's very fresh and not offensive at all. The instructions on the bottle tell you to use the product after cleansing two to three times a week. They advise you not to use it on consecutive days, however in other reviews I have read, people have done this and haven't noticed anything bad happen haha! After a couple of weeks, when you begin to notice a difference, you can reduce this down to one to two times a week. I usually apply the scrub to my face when it is damp and make small circles upwards, focussing mainly on my forehead, nose and chin. Once I have covered my face, I then wash it off with warm water and pat dry with a towel. 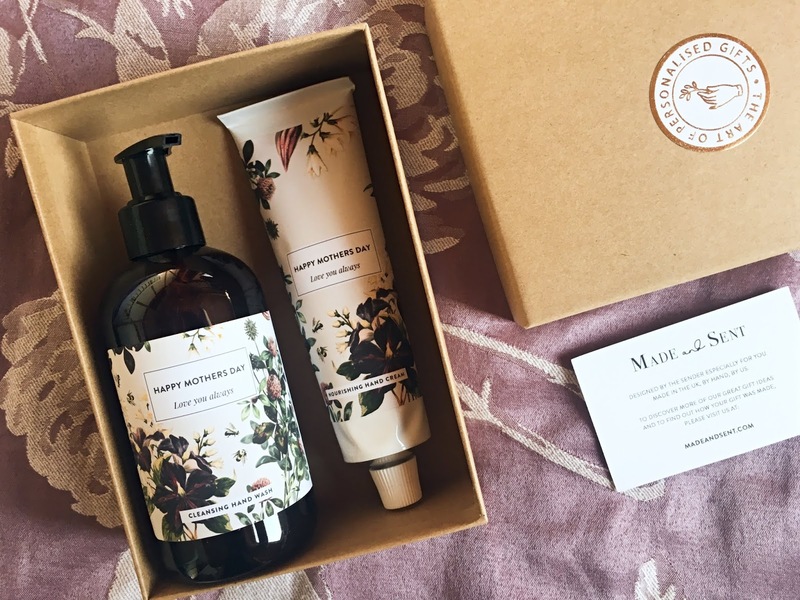 I find that my skin always feels noticeably smoother and fresh afterwards! 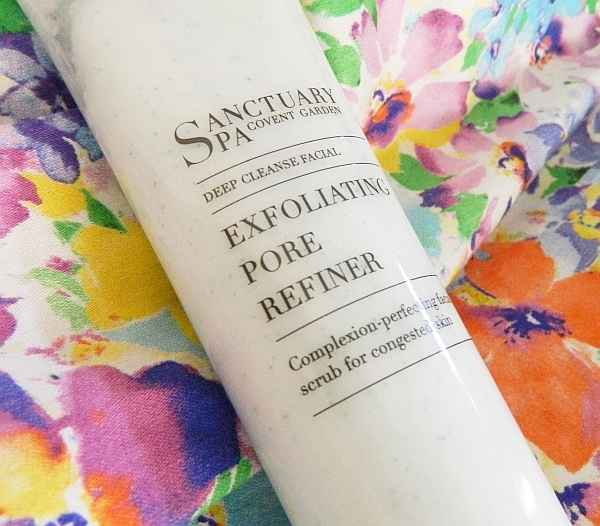 The Sanctuary's Exfoliating Pore Refiner contains witch hazel, which you may know is a product that is used to bring out bruises on the skin but it also great for fighting acne. In this case the witch hazel is used to minimise the appearance of large pores, giving you a smoother and more flattering complexion. The face scrub also contains salicylic acid to protect against the bacteria that causes skin blemishes, along with seaweed which is used to balance out the skin's oil levels. I love using this product and want to thank my mum for having it in the bathroom cupboard haha! I have since bought my own bottle! It leaves the skin feeling so fresh and clean and I've definitely noticed a difference to my skin, especially around the sides of my nose where I do sometimes find the pores are larger. At £10.50 this is definitely a more expensive face scrub, especially if you compare it to other brands like St. Ives and Boots own brand, however in this case you are really paying for the quality of the product - plus the 100ml bottle lasts for ages! 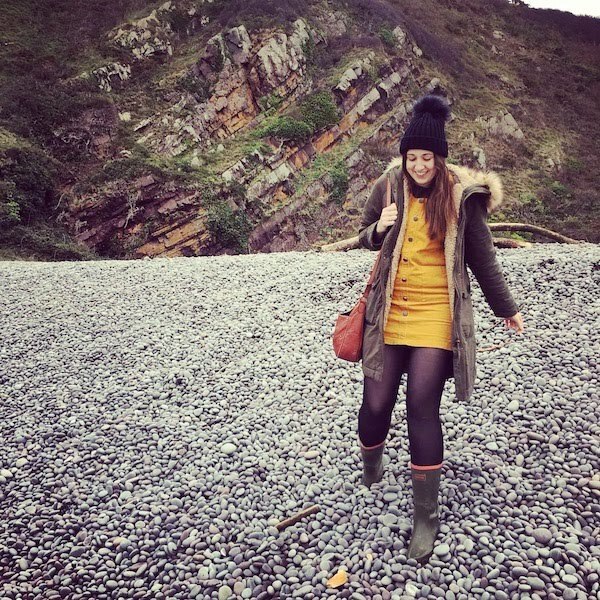 Speaking of skincare, the lovely Natasha from Shot of Beauty tagged me in the Skin Care tag earlier this week, so look out for my answers to the questions in a blog post sometime next week!